Following up on a December free preview edition, Evil Hat Productions has just released Spirit of the Season, a holiday-themed supplement for the Spirit of the Century and Truth & Justice roleplaying games. This expanded version adds new rules for mystic spellcraft, companions, and minions, as well as holiday-themed villains, heroes, and plot ideas. Some of the unique characters include Nick Saint, Judah Hammerstein, and Jacques Frost. Spirit of the Century is a pulp-themed roleplaying system specifically designed for a pick-up game with little preparation. Truth & Justice is a streamlined game for flexibility, simplicity, and speed in superhero roleplaying. 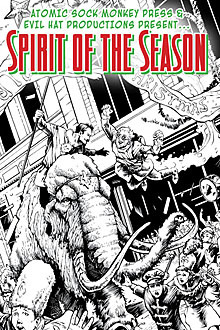 Spirit of the Season is currently available through Indie Press Revolution as a PDF plus preordered print product.